Rome was the last of the world’s greatest ancient civilizations that had a profound impact on today’s architecture, engineering, politics, and entertainment among many others, leaving behind iconic monuments testament to Roman impressive achievements. In this Rome Cabs’ exclusive Seven Wonders of Ancient Rome Shore Excursion, you can visit these world renowned ancient sites that have endured through the millennium and continue to astonish contemporary architects and engineers, inspire humanity’s imagination, and fill its visitors with a sense of timeless civilization. You’ll be driven through Rome by your own personal English speaking Driver inside a comfortable deluxe vehicle to Rome’s unforgettable ancient wonders: Colosseum, Circus Maximus, Baths of Caracalla, Via Appia, Park of the Aqueducts, Pantheon, and Trajan’s Forum. Shore Excursion from Civitavecchia Port of Call: Your Rome Cabs driver will meet you on the pier near your pier at 7:30 AM, and bring you back at approximately 5:00 PM. If you wish to book this Seven Wonders of Ancient Rome tour as a day tour starting and ending in Rome, please click HERE to book. Your first stop will be at one of the most recognizable monuments in the world and the iconic the symbol of Rome: the Colosseum. Considered one of the greatest examples of Roman architectural and engineering achievements, this elliptical amphitheater is on the list of Wonders of the World. Built in 72 AD by Emperor Vespasian over an area that once was Nero’s Golden House, it is estimated that it required over 4,600,000 cubic feet of travertine stone blocks set in place without mortar, but held together by 300 tons of iron clamps. An engineering feat in itself considering the lack of modern equipment, the Coliseum was engineered to seat up to 50,000 spectators and was primarily used for gladiatorial games and other public spectacles such as animal hunts, re-enactments of famous battles, mock sea battles, mythological plays, and executions. On this visit you have the opportunity to enter the Coliseum where all the action took place for nearly 4 centuries! Nearby is the remains of the first and largest stadium for public games built in the entire Roman Empire, and the model that inspired many more since. At over 2,000 feet long and nearly 400 feet wide, and accommodating more than 150,000 spectators, it continues to hold the prestigious title as the world’s largest stadium ever built. Famously known for its death defying chariot racing, the stadium also hosted gladiatorial games, animal hunts, plays, religious and public ceremonies, parades, and elaborate parades. Today, all that survives from the stadium is its outline with the spina in the center, and over time it’s been transformed into a public park with a spectacular view of the once prestigious Palatine hill behind it. From here you will visit the Imperial bath and spa complex that certainly inspired awe in in the ancients themselves. Italians’ love for thermal baths and recreation dates way back to the days of Ancient Rome. 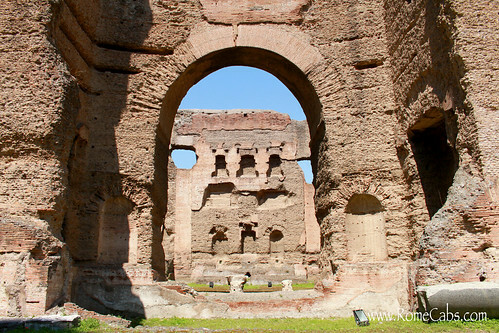 The Baths of Caracalla were not just thermal baths, but the most impressive and well preserved surviving example of an Imperial bath and recreational complex in Antiquity. Built by Emperor Caracalla in approximately 212 AD, the bath complex was able to accommodate up to 10,000 people at a time with 1,600 bathers in a vast area covering approximately 1,000,000 square feet. The massive complex included an Olympic size swimming pool (natatio), a cold baths (frigidarium), a hot baths (caldarium), and exercise courts (palastrae). Throughout an intricate two level subterranean network of rooms and passageways were service areas that operated the baths, and systems that drained liquid waste into underground sewage channels. The interior of the baths was once richly adorned with architectural opulence that included 252 columns - some 16 of which weighed approximately 50 tons. Many priceless columns, sculptures, mosaics and statues that once belonged inside the baths can be found scattered throughout Italy in churches, piazzas, buildings and museums. Aside from bath areas, the complex also included large public libraries in Greek and Latin, gardens, and shops. Business meetings were often held here in conference rooms. For Ancient Romans, bathing was not just a normal function of cleanliness and relaxation, it was also a common way for people to connect, network, mingle and conduct business. 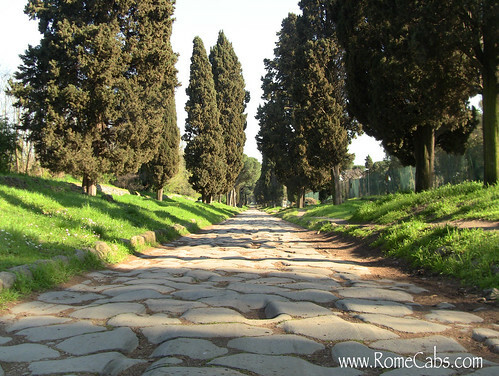 There is truth in that during ancient times, “all roads lead to Rome”, as Romans were excellent road builders...and Via Appia (Appian Way) is testament to that. Named after the magistrate who initiated its construction, Appius Claudius Caecus, the road was built to connect Rome to Capua at a time when the region of Campania was forming a joint political existence with Rome. . Built in 312 B.C., Via Appia is remarkably straight with few exceptions due to topographical factors. During ancient times, surveyors were only able to create straight routes. Along the way, “pit-stops” were created where horses could be changed and travelers could eat and rest. The Ancient Appian Way is impressively well preserved where you can get an overall idea of what an ancient Roman road used to be like. Within the original stones, you can see the grooves created by chariot and wagon wheels that traveled through here for centuries. Lunch will be enjoyed at a traditional Italian restaurant or trattoria for an authentic Italian culinary experience. After lunch we will continue to the Park of the Aqueducts. Bringing fresh water to Rome gave the city the possibility to grow and flourish, and this was done through the incredible achievements of aqueducts. Roman engineers understood the principles necessary to allow water to move uphill and downhill through the aqueducts as it traveled long distances. While large portions of the aqueducts were underground, some were above ground, especially as the aqueducts neared the city of Rome. Fresh water was brought from the distant hills and it generously poured from Rome’s many public fountains. Some of these ancient aqueducts continue to be in use today in varying capacities. 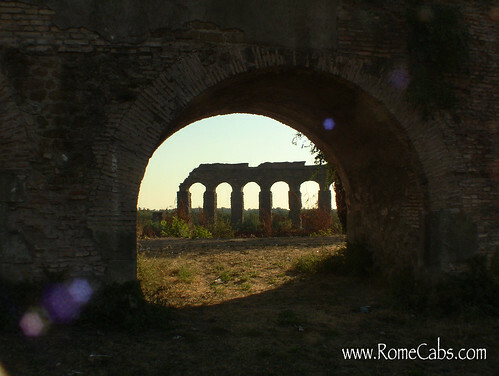 In the Park of the Aqueducts you can see the majestic beauty of what remains of some of the seven major aqueducts recognized by their distinguished arches that supported the flow of water. Our next stop is in the charming Piazza della Rotonda to visit the Pantheon, one of the most impressive architectural monuments of Ancient Rome. After nearly 2,000 years, this ancient monument is also the longest in continuous use in the world, its survival due to its exceptional strength and stability, and its 7th century conversion into the church of St Mary of the Martyrs. A captivating historical fact about the Pantheon is that the building we see now is the third Pantheon that was built on this very spot: the original built by Marcus Agrippa in circa 27 AD but burned in the great fire of Rome in 80 AD. The second Pantheon was rebuilt by Emperor Domitian, but it was struck by lightning 30 years later and burned down as a result. The current Pantheon was built by Emperor Hadrian in 125 AD and dedicated to its original builder, Marcus Agrippa - the dedication inscription can be boldly seen on the front. The miracle material discovered by the Romans, concrete, enabled them to create monuments that withstood the test of time. 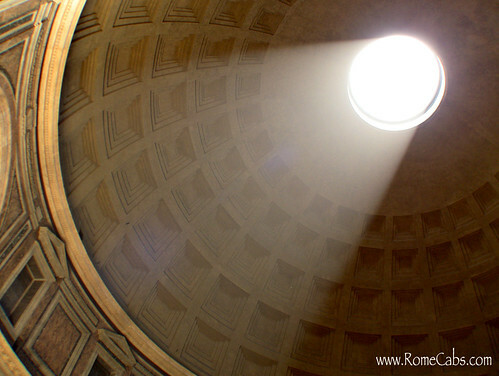 What the Pantheon is most famous for is its impressive dome that has inspired architects for centuries. It was also the largest concrete dome in the world until the 1958 CNIT building in Paris. In the center of the coffered dome is the oculus, a round opening that allows light and the weather to enter inside the circular interior. Inside the Pantheon are also tombs of some of Italy’s most illustrious: famous artist Raphael, and Italy’s former kings Vittorio Emanuele II, and Umberto I with his wife Queen Margherita. While the original purpose for the Pantheon remains unknown, its own name indicates that it was a temple dedicated to all gods. Inside this great complex you can see the famous Trajan’s Column, a victory column comprised marble bands that detail Trajan’s successful military campaign against Dacia (present day Romania) whose spoils paid for the construction of the forum. Below you’ll see numerous foundations and columns that once belonged to Greek and Latin libraries, Hall of Liberty, Temple of Trajan, and Basilica Ulpia. 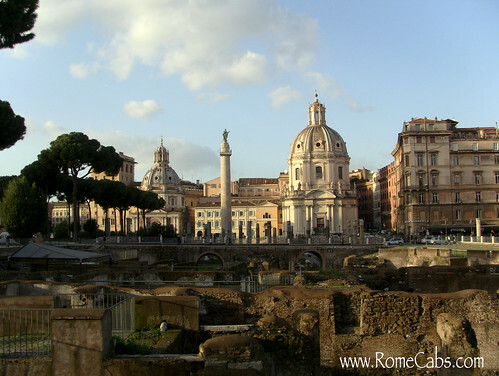 In the background in a semi circle once stood the unprecedented Trajan’s Market, the ancestor of today’s shopping centers that also functioned as civil and administrative centers. 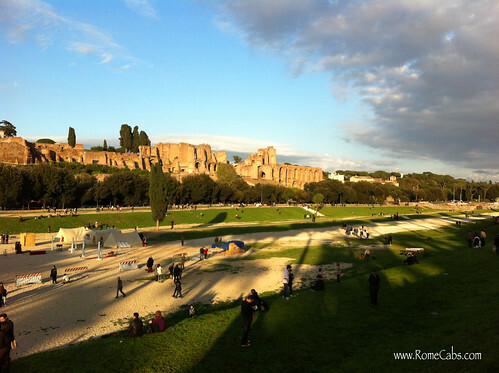 This marks the end of the Seven Wonders of Ancient Rome tour with RomeCabs. Your driver will now return you back to your ship. Rome’s history is vast, complex and enduring....thus the sobriquet Eternal City. We thank you for choosing RomeCabs Limousine Service for your tours, shore excursions and transfers. We look forward to seeing you in Italy soon! Guests who booked this “Seven Wonders of Ancient Rome” Tour also enjoyed “Etruscan Mystery”, “Ostia Antica and Cerveteri”, and “Castles and Lakes” via our sister company Stefano Rome Tours. * The price of this “Seven Wonders of Ancient Rome” tour includes a private deluxe vehicle with a personal English speaking Driver, Italy’s VAT tax, fuel, insurance, and any applicable toll and parking fees. * The price of this “Seven Wonders of Ancient Rome” tour does not include entrance fees into monuments, lunch, gratuities, licensed tour guides, or other personal expenses you may incur on this tour. * The total price listed is per vehicle, not per person. Individuals may split the cost of the tour among themselves as they wish. You can save a lot on this Shore Excursion tour by sharing your tour with other cruisers for up to 8 passengers per minivan! Just place an ad on Cruise Critic’s roll call with a link to this tour and invite others to join. Do you wish to book a tour for more than 8 persons? Please click here to find out how to book multiple vehicles for parties larger than 8. Italy's stringent laws prohibit Drivers from acting as a guide and/or accompany guests away from the vehicle to sightsee inside monuments, museums, churches, or squares. In order to be in compliance with the laws, Drivers are obliged to remain with the vehicle while you sightsee. If you are pleased with the service you receive from your driver 10-15% gratuity is customary in Italy. If you wish to have a private licensed tour guide accompany you to any of the sites for a private guided tour, please inquire with us for a quote and to book a guide for you. It has been reported that staring in May 2018, the Pantheon will begin charging Admission Tickets (currently estimated at 2 EUROS Per Person). Please be prepared for potential ticket lines or wait times to visit this monument. If you are from the United States, select "Stati Uniti" when prompted to select your country of origin. The entry ticket to the Baths of Caracalla is currently 6 Euros per person and can be purchased upon arriving at the site. Please note that some sites throughout Rome may close without notice. If sites on the itinerary are closed, they will be replaced with other exciting places in Rome. Payment is made in Euro funds at the end of your tour, and paid directly to your Driver. You may also prepay in advance via PayPal. Please let us know when you book your tour if you wish to prepay in advance and just enjoy yourself on the day of your tour. We do not accept credit card payment. Don’t worry, we never ask you for your credit card information, require down payments to reserve your tours, or penalize you with any fees for cancellations. We operate on the Honor System, so we kindly ask that cancellations be made at the minimum 7 days in advance so we can rebook the service and your reserved driver does not lose work for that day. * For your comfort and safety, please wear comfortable shoes and clothing during shore excursions and tours. * There are plenty of opportunities to take photographs and videos on this tour, so be sure you have plenty of film and batteries, and your cameras handy! * During the summer months it’s safest to wear sunscreen, sunglasses, and a hat to keep the hot sun off your head. Please be sure to wear comfortable shoes, and on sunny days wear sun protection, sunglasses and hat to protect from the strong sun. All visitors are required to pass through this security check point, regardless of obtaining no-line tickets in advance. To minimize the impact of such delays, we suggest a 7:30 AM pick up time for Shore Excursions from Civitavecchia. Should you still encounter wait times upon your arrival, you can use the same Colosseum tickets to visit the fabulous Roman Forum instead. 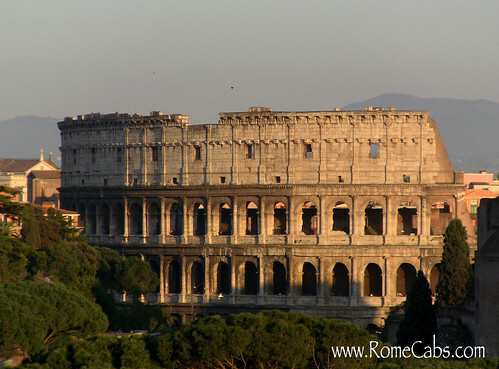 * The real name of the Coliseum is Flavian Amphitheater, after the family name of Emperor Vespasian. * Coliseum is an informal name given to the amphitheater due to the colossal bronze statue of Nero, Colossus Neronis, that once stood in front of the amphitheater. * The Bath of Caracalla complex measured 337 x 328 meters. * The cisterns used in the bath areas had the capacity to hold up to 2 million gallons of water brought in from the Marcian Acqueduct. * It took approximately 9,000 workmen 5 years to complete the bath complex.